The Army Black Knight's defeated the Holy Cross Crusaders 67-53 at the United States Military Academy's Christl Arena in West Point, NY on Wednesday, January 14, 2015. 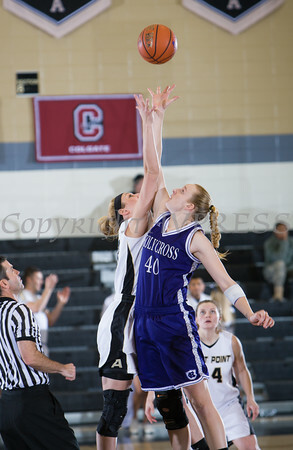 Army Forward Aimee Oertner (33) and Holy Cross Center Molly Hourigan (40) leap for the opening tip off as the Army Black Knight's defeated the Holy Cross Crusaders 67-53 at the United States Military Academy's Christl Arena in West Point, NY on Wednesday, January 14, 2015. Hudson Valley Press/CHUCK STEWART, JR.